Crock Pot Garlic Mashed Potatoes are the best garlic mashed potatoes I have ever eaten. Make life easy and throw some russet potatoes in the crock pot along with some golden roasted garlic for the best garlic mashed potatoes you will ever taste. Homemade mashed potatoes are the best mashed potatoes. You just can’t get the same creamy rich tasty mashed potato flavor from a box. But making homemade mashed potatoes are a little bit more work than dumping some dry potato flakes into a pot of boiling water. So my advice is to make homemade crock pot garlic mashed potatoes for special occasions. Like when you have the family over for Sunday supper. Or when you are serving Thanksgiving or Christmas dinner. Homemade garlic mashed potatoes are delicious served with roasted turkey or a baked glazed ham. You have three options when it comes to making Crock Pot Mashed Potatoes. Plain but creamy & buttery mashed potatoes – leave the roasted garlic out and follow the directions. Garlic Mashed Potatoes – add half the amount of minced fresh garlic and follow the directions. Roasted Garlic Mashed Potatoes – follow the directs as is. I am all about roasted garlic mashed potatoes. I love roasted garlic and make it as often as possible. When I do make roasted garlic I eat those little golden cloves of garlic right from the oven when they are still warm and oh so delicious. Roasted Garlic Mashed Potatoes have a rich garlicky flavor from the roasted garlic that you just can’t get when using fresh minced garlic. If you have never before tried Roasted Garlic Mashed Potatoes you are in for a treat. If you have never made roasted garlic you are in for a treat. Cut the top off each garlic head, wrap in aluminum or parchment paper, leaving an opening at the top. Drizzle one tablespoon of olive oil over each head of garlic and close up the top. Place the garlic bundles in a cake pan and roast at 400 degrees for 40-50 minutes or until the garlic cloves are golden brown. While the garlic is roasting peel the potatoes and rinse well. 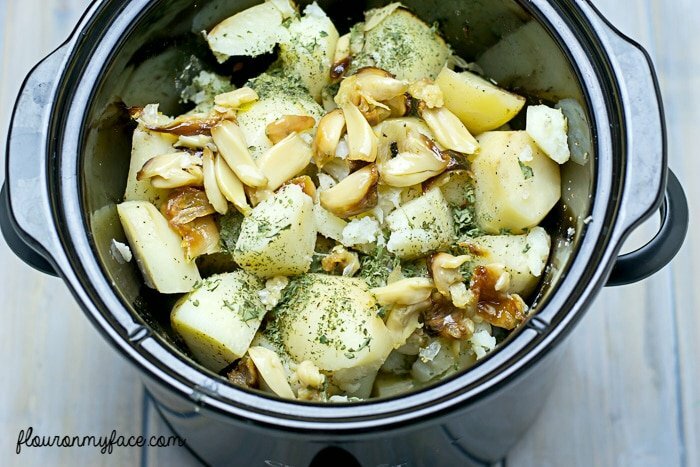 Place the potatoes into a crock pot with 1/2 teaspoon salt, 1/2 teaspoon pepper, and one stick of butter. Place the lid on the crock pot and cook for 3 hours or until tender and potatoes fall apart when you pierce them with a fork. Remove the roasted garlic cloves from the garlic head by squeezing the bulb until the softened garlic cloves are free from the paper. Place the roasted garlic cloves and any olive oil that accumulated as you squeeze the cloves free in a bowl until you are ready to beat the potatoes. Once the potatoes are done add the remaining salt, pepper and parsley to the crock pot. Using a handheld mixer without turning it on mash the potatoes until all the pieces are broken apart. Add the butter and roasted garlic to the crock pot and beat for about one minute. Add the milk to the crock pot and beat for one or two minutes. If you like lumpy potatoes one minute will be enough beating. For lump-free potatoes beat for two minutes. Crock Pot Garlic Mashed Potatoes recipe made with russet potatoes and homemade roasted garlic. Using a handheld mixer with out turning it on mash the potatoes until all the pieces are broken apart. 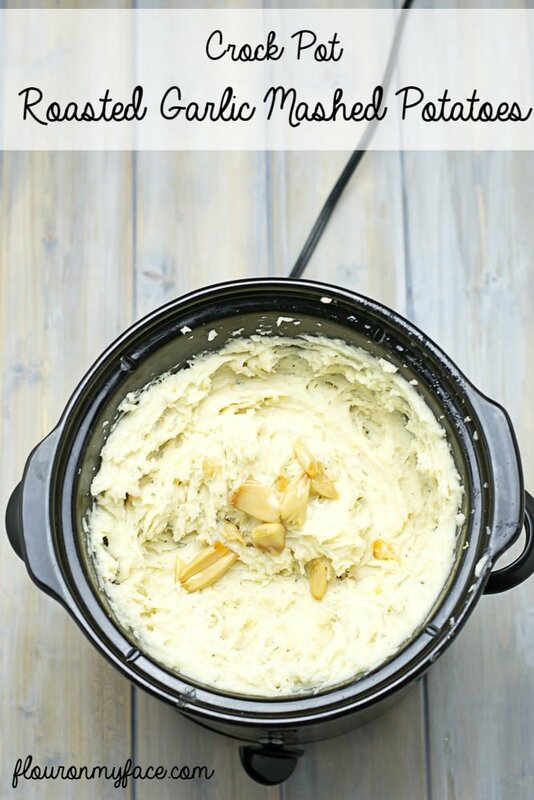 Need more crock pot recipes like this Crock Pot Garlic Mashed Potatoes recipe? 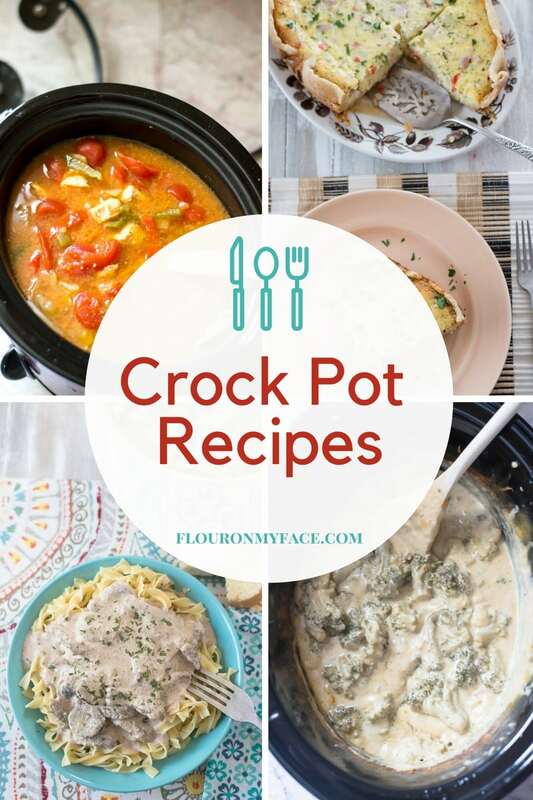 Head over to my crock pot recipe page for over 200+ Crock Pot Slow Cooker recipes. I love crock pot mashed potatoes too. I made them for Thanksgiving. I love your recipe to make them. I have a blog party I co-host on Monday’s called Cooking and Crafting with J & J. I would love to have you join us sometime.